[Thursday 3pm #4] The tragedy of Robert Wadlow, world’s tallest man? For my eighth birthday, my uncle gave me a discarded library copy of the 1983 Guinness Book of Records. It became one of my favourite books. To my child mind, conditioned by test scores and sports statistics, it told the whole story of the world, of everything important. One of the few records I remember vividly was that of the world’s tallest man, Robert Wadlow. The book featured a photograph of a plastic model of him, with Britian’s tallest living man and a man of average height standing next to it. At 8 foot 11 inches or 282 cm (and of course I memorised this measurement) he stood over a metre taller than a typical man. He seemed a figure from the distant past, with nothing more to be known of him than his height, his date of birth in 1918 and his death at age 22. Twenty-two sounded quite old to me at eight. I wished I was the world’s tallest man and found my way into the Guinness Book of Records. Now, 22 sounds so young and I realise that he was born the year after my grandfather. And I would hate to be the world’s tallest man. Last week I saw Robert Wadlow mentioned in passing and I went looking for him on the internet. I discovered there was so much to his story. He was born in small town America – Alton, Illinois – and it seems the town has never got over its only claim on world attention. Today a bronze statue, life-size, of Robert is found at a local university, as well an exhibition at the museum. Robert was normal height when he was born, but started growing rapidly in the first few months of his life because of an over-active pituitary gland. He attracted attention in newsreels as the world’s tallest boy scout; but he tried to be a normal American boy, collecting stamps and joining the Freemason youth club (presumably this what one did in small town America). One source says he was happy at high-school and lived semi-normally, but when he got to college, people were not so understanding, and he returned home after one semester. A tragic figure who hated his size and his life. He was forced into the role of a first-class freak by his father, who paraded him around the country in a specialized Ford Model T (it had the front passenger seat removed, and Robert sat in the back.) His father quit his job as worker at an oil company to devote himself to Robert and his career. In all, Robert made 747 personal appearances around the country, appearing at everything from store grand openings to Ringling Brothers/Barnum&Bailey Circus. He was born of normal size, but early in his life he developed a problem with his pituitary gland, and by age 9, he was 6 feet tall. He lived in a racist time in America, growing up in lilly white Alton, IL. He listened to the radio a lot and followed the rise of Hitler. He was fascinated by Germany enough to switch his foreign language class in high school from Latin to German. He was experimented on for many years at Washington University in St. Louis by a doctor who was from Germany. Robert would always insist on the doctor sharing stories of his homeland. His intelligence was limited. He graduated from high school, but dropped out of college after one semester. That is when he began his career. In his first job he promoted a shoe company, which supplied him with his size 37 shoe. For most of his life he was the center of attention. He made the newsreels anually on his birthday. The Alton Telegraph, the local newspaper, often followed his life. In July 1940, in Manistee, Michagan, Robert was being paid to appear in a 4th of July parade. The tempature was sweltering and the humidity unbearable. His father wrote a book along with a ghost writer in 1945 about Robert. It was a PR puff piece which glowed with anecdotes about what a great father Robert had. But, great father, or not, Robert had an infection on his left ankle which was left untreated, and on that hot summer day, the tallest man who ever lived finished his 4 hour appearance in the parade (he rode in the back of a truck,) and when he got back to the hotel room, he collapsed, and a doctor was summoned. He lingered in the hotel room for 3 days before he died. Two beds had to be placed end to end to accomodate him. In Alton, it was reported that 30,000 people attended his funeral. Remarkable only for his size, Robert Pershing Wadlow died an unfulfilled soul. If nothing else, the imdb.com account is a fascinating embellishment of Wadlow’s life. I can’t find any other reference to the Nazi flirtations or the experiments. The official account agrees that he did spend the last years of his life promoting shoes. The circumstances of his death are also relatively uncontested. But most accounts stress how his parents did everything they could to prevent him becoming a freak. They sued a newspaper that described him as a ‘freak’; they destroyed all his belongings upon his death (the museum claims ‘We want to continue to honor their wishes, and are displaying what items we have in our museum with pride and dignity’) and they filled his grave with concrete to prevent his body being excavated for medical experiments. I keep thinking of his body lying under all that concrete. The only book that seems to have been published about him besides the ‘PR puff-piece’ is an Alton published one from 2003 called ‘Boy Giant’. I think his story is worth exploring in a novel. And a film. An interesting post on Robert can be found here. A short documentary can be found here. An excellent and well balanced article about the tragic life of this Alton, Illinois icon. The Alton Museum of History and Art has tasteful ongoing display featuring Robert Wadlow memorabilia and personal items that I would encourage anyone who can, to view. Alton, Illinois is just across the Mississippi River from St. Louis, MO, only 25 minutes from STL Lambert St. Louis International Airport, 25 minutes from the St. Louis Gateway Arch, 90 minutes from Springfield, Illinois or 4.5 hours from Chicago, Illinois. My wife and I own and operate The BEALL MANSION Bed and Breakfast in Alton, Illinois. 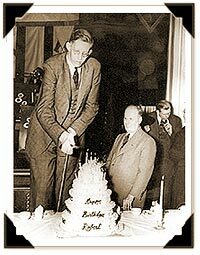 Robert Wadlow is the only person I remember from the Guiness book of Records too. I always felt really sad when I saw his picture. It wouldn’t be fun to live life crouching through doorways. James, if we ever get to the USA, we’ll have to stay at your B&B. Mel, as a kid I didn’t even think practically like you – I just thought it would be cool to be taller than anyone else! But you’re right, it would be horrible. I wonder if we read the same edition. But then he was probably in every edition. It’s never to late to comment, I hope! Thanks for remembering Wadlow in this post! I just happened to read the IMDB bio the other day and it’s pretty odd stuff — I’ve never heard that his relationship with his dad was anything but great, but who knows behind the scenes. I think the IMDB bio is more “novelized” than strict bio. What a fascinating fellow Robert Wadlow was, and boy, would I like to see a full-length bio film on him!